Every player travels down a different road as they try to make it to the next level. In Jeremy Rhoades case his road was forever changed by a couple different events while playing for his high school team in Wheaton Illinois. As a junior, Rhoades was primarily a catcher for Wheaton Warrenville South High School, when he asked for an opportunity or some additional time on the pitcher’s mound. The opportunity became more of a reality when Rhoades broke a finger near the end of his junior year which made catching difficult. As a senior, Rhoades more than held his own on the mound finishing the year with a 6-4 record. In 69.1 innings of work he struck out 81 batters and had an ERA of 2.21. He was named MVP of his team and was also honored by being named to the All-Dupage Valley Conference team. After graduating from high school, Rhoades decide that he would take his next step toward the majors by playing baseball at Illinois State. In his freshman year at Illinois State, Rhoades appeared in 16 games and made four starts. In his 45.1 innings of work the right hander compiled a 4-4 record and struck out 32 batters. Building off his freshman campaign, Rhoades delivered what turned out to be an outstanding second season. Appearing 26 times exclusively out of the Redbirds bullpen, Rhoades went 2-1 while picking up six saves. In his 41 innings of work he struck out 37 and finished the season with an impressive 1.54 ERA. As a junior, Rhoades once again split time between the Redbirds bullpen and starting rotation. In 19 appearances (8 of them starts), Rhoades went 6-4 which included two complete game victories. The right hander pitched in a career high 76.2 innings and struck out 92 (10.8 K/9). He also kept base runners off the bases with a 1.161 WHIP his junior year. Rhoades took a no-hitter into the 8th inning during his May 13th start. With the 2014 draft approaching, Rhoades knew a number of teams had shown interest during his junior season at ISU. The 6’4 right hander packed a four pitch mix including a slider that some scouts deemed best in the 2014 draft class. Rhoades compliments his wipe out slider with both a two and four seam fastball and a developing a change-up. In the fourth round of the 2014 draft, Rhoades was selected by the Angels and was set to begin his professional career. The Angels assigned Rhoades to the Orem Owlz in the Pioneer League. Like his time in college, he split time both starting and coming out of the bullpen. In 14 appearances (7 starts), Rhoades went 2-1 while striking out 40 batters in 38.2 innings of work. The Angels assigned Rhoades to the Burlington Bees of the Midwest League to kick off the 2015 season. In the first quarter of the season, Rhoades has pitched exclusively as a starter and has provided solid results. 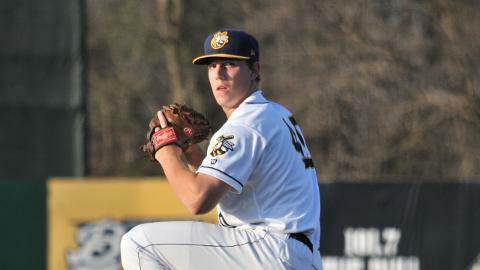 In 8 starts, Rhoades has posted a 3-3 record while striking out 49 batters in 47 innings of work. In a recent start on May 13th he took a no-hitter into the 8th inning against the Kane County Cougars. Unfortunately for Rhoades the no-hitter was broken up in the eighth inning and the Cougars went on to score three runs. Rhoades ended up with the loss as the Bees fell 3-1. Rhoades will look to continue to build off solid outings while he continues to refine his change-up on the mound to compliment his other pitches which are already solid offerings. 1. Take us back to your draft day. How did you spend the day and what where you doing when you got the news that the Angels had selected you? I was at home with my family, just kinda hung around the house and didn’t do much that day. I was just waiting for the time that my name was going to be called. When the Angels finally called I was sitting around the study with my entire family. It was just a cool opportunity to talk to them and have them tell me they were going to select me and then to see my name come up on the computer it was awesome. I had talked to the Angels once before the draft but it was just a meet and greet with their area scout and after that I didn’t hear anything from the Angels. I thought that I was going to go to another team but I ended up in a great organization and I love where I am at right now. 2. Tell us a little bit about your game on the mound. What pitches do you throw and what is your approach when you’re on the mound? I throw both a four seam and two seam fastball. To go along with that I throw and change-up and a slider. When I’m on the mound I try to attack the bottom half of the zone and challenge hitters to beat me with my best pitch. 3. Besides the day you make your start can you take us through your routine on the other four days you’re not making a start. The day after I start I play some light catch up to about 90 feet. I also get a lift in and I run 18 poles. On the second day, that is a bullpen day so I throw about a 30 pitch bullpen session followed up by a run. Day three I throw a short drill of bullpen in front of the plate for about 12 to 15 pitches and run some sprints. On the day before my start I play some light catch, usually up to 90 feet and some short sprints and then day five comes and its time to start again. 4. Up until this point in your career who has been the most influential person in your career? It would have to be my college pitching coach Billy Mohl would be the guy. He saw something in me when I was in high school and just a raw and talented kid. He helped refine me and help make me into the pitcher I am today in just three short years. 5. In the month of April you were named the Angels organizational pitcher of the month. How did it feel to be honored with an accomplishment such as that? It’s a cool accolade. I was pretty honored to be named pitcher of the month for the entire organization. To get that recognition is pretty cool. 6. In your May 13th start, you took a no-hitter into the 8th inning. Can you take us back to that start and tell us how you were able to achieve that success through 7 1/3 innings? On the flip side the game didn’t end up how you wanted to end up. Mentally what do you have to do to bounce back during your next outing? I went out there and tried to pound the bottom of the zone and attack guys when they came to the plate. I just wanted to make them try to put a ball in play to beat me. I looked up after giving up a hit in the 8th inning and realized that I hadn’t given up a hit until that point. I really didn’t know I just stuck to my plan to go out there every inning and attack guys. I try to take the positives out of every outing so it wasn’t really frustrating. Even in that last inning I made and executed pitches down in the zone and things didn’t go my way. I don’t beat myself up about things like that, I just stick with my routine and structure of the week and go back out there and try to have another successful outing. 7. Looking forward to the rest of the 2015 season what are some things goal wise that you would like to accomplish? I just want to go out on the mound and give my team the best chance to win during every start. I’d like to go out there and at the end up the season win a championship here with this team. I like to live in the short-term so for now that is all I’m focused on. Greg Maddux – He was a bulldog on the mound. He didn’t always have the most overpowering stuff but he perfected his pitches and the whole craft of pitching. It is still pretty cool to go back and watch old games of him throwing and watch how amazing he was on the mound. 2. So far in your baseball career what has been your most memorable moment? Being on the mound my sophomore year and winning conference outright. Getting the dogpile and being on the bottom of that dogpile. It was a fun place to be. 3. One random fact about you that people may not know? I used to be a gymnast for eight years when I was growing up. A special thank you to Jeremy Rhoades for taking some time out of his busy in season schedule to talk to us. Please follow him on twitter at @windingrhoades . We look forward to following him all season long and into the future. Please like Chasing MLB Dreams on Facebook and follow us on twitter @CTD_Sypien as we continue to feature and follow all of our featured players as they chase their way to the major leagues. Jeremy is a great person and has a great family that supports him no matter what his dream to be. Great interview. Great ball player. Good luck Jeremy!